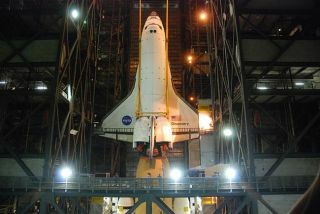 Before its last rollout, space shuttle Discovery is hoisted into position to be attached to its external tank and solid rocket boosters for its final launch into space on the STS-133 mission to the International Space Station. NASA attached the space shuttle Discovery to its fueltank and twin rocket boosters over the weekend to gear up for the spacecraft'sfinal voyage to orbit later this year. Discovery was firmly attached its 15-story external fueltank and solid rocket boosters Saturday after a slight delay due to a looseattachment nut that slipped into the spacecraft's aft compartment on Friday.The 100-ton shuttle was hanging vertically near its external tank inside NASA'scavernous Vehicle Assembly Building at the Kennedy Space Center in Florida whenthe nut slipped loose. Shuttle technicians were able to retrieve the nut bysetting up access gantries to reach a door in Discovery's aft compartment ?something not usually done with a shuttle hanging in its vertical launchposition. NASA plans to begin rolling Discovery out to its seasidelaunch pad on Monday, Sept. 20 at about 8 p.m. EDT (0000 Sept. 21 GMT).Officials at the Kennedy Space Center are expecting hundreds of space centerworkers to turn out to watch the event. The shuttle movedfrom its hangar to the Vehicle Assembly Building on Sept. 9. "We're allowing a number of employees to bring theirfamilies out to see the rollout," NASA spokeswoman Candrea Thomas toldSPACE.com. "I expect we'll see several hundred." Discovery is slatedto launch Nov. 1 on an 11-day mission to the InternationalSpace Station that will mark the spacecraft's final tripto space. The mission, STS-133, will be Discovery's 39th spaceflight and isexpected to deliver a storage room to the International Space Station alongwith a humanoid robot assistant for the outpost's astronaut crew. NASA plans to retire its three remaining space shuttles ?Discovery, Atlantis and Endeavour ? next year to make way for a new plan aimedat sending astronauts to visit an asteroid by 2025. Discovery is the oldest ofNASA's space shuttle fleet. Only two more shuttle missions are currently scheduled,including Discovery's November flight, before the reusable space plane fleet isretired. The shuttle Endeavour is slated to fly the final shuttle mission inFebruary 2011. There is also discussion in Congress on the possible addition ofone extra mission to be flown by Atlantis sometime next year. This story was corrected to reflect that Discovery's last mission will be STS-133 in NASA's shuttle manifest.